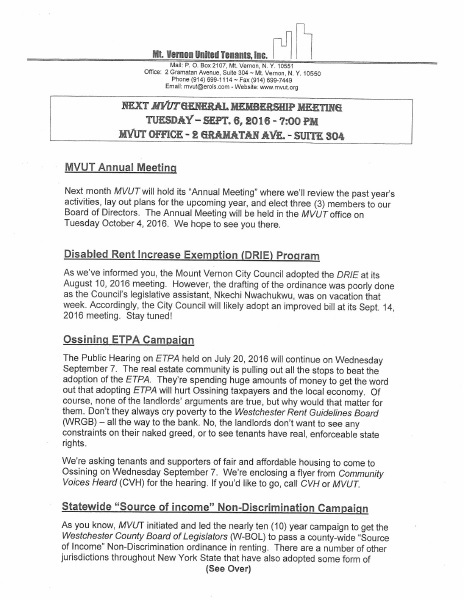 Next MVUT General Membership Meeting is tonight, Tuesday Sept 6 at 7:00 PM at the MVUT office, 2 Gramatan Avenue in Mt. Vernon. Next month, we’ll hold our Annual Meeting where we’ll review the past year’s activities, lay out plans for the coming year, and elect three (3) members to our Board of Directors. The Annual Meeting will be held in the MVUT office on Tuesday, October 3, 2016. We hope to see you there!